As a master puppeteer, Regina Marscheider spreads smiles and joy through a myriad of entertainment venues. Her performances have electrified thousands at such grand events as the Virginia International Arts Festival in Norfolk, Virginia, shows at the American Music Theater in Lancaster, Pennsylvania, tours in New York, California, Las Vegas and numerous other cities throughout the U.S. and Canada. On a missionary trip to Guatemala, she taught puppetry and performed at the Prince of Peace Orphanage for little girls. For 9 years, she produced and directed BeachStreet USA family entertainment at the Virginia Beach oceanfront. 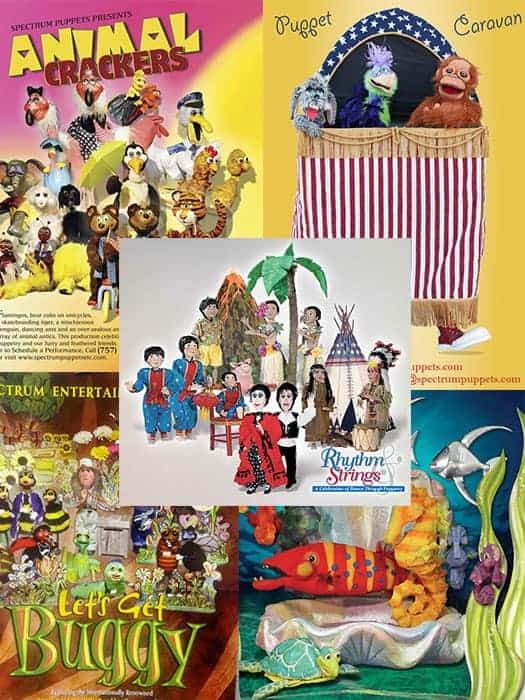 Through partnerships with the performing arts, Regina has thrilled audiences with “Peter And The Wolf” along with the Virginia Symphony, built puppets for “The Nutcracker Ballet’ for the Virginia Ballet Theater and has collaborated with many culturally divers groups. Her show, “Rhythm and Strings” celebrates dance through puppetry and features Flamenco dancers, Chinese acrobats, Irish step dancing, tribal mask, Philippine stick dancers, our own Native American Indians, and the list goes on. For the past thirty years, Regina has used her talents in puppetry and the performing arts to fight child sexual abuse, an epidemic that 1 in 4 girls and 1 in 7 boys will have experienced by the time they are 18 years of age. A survivor of child sexual abuse, Regina heeded to a call to help children protect themselves, and created Stop Abuse – Powered By Spectrum Puppets, a 501 (c) 3 organization with the mission to prevent child sexual abuse through education, detection and referral. After two years of intensive research with law enforcement experts, educators, pediatricians, child psychologists, survivors and offending and non-offending adults, a 4-part comprehensive program was developed for schoolchildren, kindergarten through grade 5. Through her Emmy Award-winning marionette program, “Simon Says Just Tell’ children learn to recognize, prevent and disclose sexual abuse in a gentle, non-threatening environment. The show has been performed to hundreds of thousands of children throughout the United Sates and Canada, prevented thousands of cases of abuse and has resulted in the arrest and incarceration of 158 child molesters in Virginia, alone. Regina and her passionate volunteers at Stop Abuse continue to fundraise year-round in order to bring this mission critical education to as many children a possible globally.